San Diego, CA (USA) -- For the first time, a Buddhist fraternity and sorority are coming to the San Diego State campus. This year, the Delta Beta Theta sorority and Delta Beta Tau fraternity are in the process of becoming chartered Greek organizations. 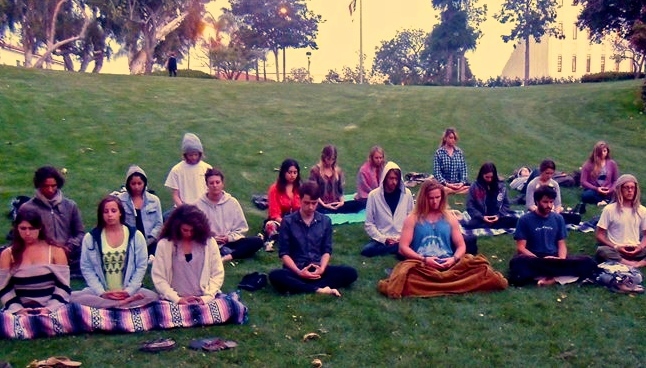 Jeff Zlotnik, co-founder of the Dharma Bum Buddhist Temple in San Diego, and Abby Cervantes, a student of the temple, are establishing the new organizations on campus. They will spend the semester gathering members and gauging campus interest. This semester they plan to begin meeting weekly to meditate and discuss Buddhism. Soon, they will formally request to join the Greek community. As a former social fraternity member at the University of Arizona, Zlotnik said he understands college kids have a different lifestyle than monks, and he does not want to lecture them. But he said teaching new members compassion and kindness can change both their lives and the lives of others. He hopes to enrich their college experience. “It’s not just about those four years, you’re impacting their entire life and their future,” he said. “That’s something you have to take seriously,” he said. Sandra Wawrytko, director of the Center for Asian and Pacific Studies and a professor in the philosophy department, supports starting the new organizations. While there is little precedent for Buddhist Greek organizations on campuses around the country, Wawrytko is excited to see the student body’s response. Zlotnik plans for the organizations to be social and enlightening. While preserving cultural traditions, the organizations will host intramural sports, philanthropic outings and events with other organizations on campus. “Instead of a keg, we’ll have a meditation room,” he said. Fraternities and sororities have been on campuses for hundreds of years. Zlotnik expects these organizations will have similar longevity. Zlotnik began his path to Buddhism while taking a Chinese civilizations class in college. He said it took being a consultant in downtown San Diego and living what he called a “consumerist lifestyle” to truly appreciate what Buddhism had to offer. After he began regularly visiting a temple in University Heights in 2003, he decided to devote his life to Buddhism. He was president of the temple for two years and spent 11 months in a monastery in Taiwan before opening up the Dharma Bum Temple with a group of other Buddhists. After starting the temple, the group began running Buddha For You, a Buddhist shop in the Campus Plaza shopping center, where they sell statues, incense, books and clothes. They have free introductory meditation classes Tuesday nights and Saturday mornings and run a summer program to further bring Buddhism to the community.